Just over 240 years have passed since the Sons of Liberty defiantly tossed an entire shipment of tea into the Boston harbor. And so began the Revolutionary War. In the aftermath of the Boston Tea Party, John Adams wrote letters to his wife that professed his love for tea, but admitted his reluctant switch over to coffee. Apparently, tea had become unpatriotic and lost its appeal. Thus, coffee began it’s reign. But regardless of where it’s being consumed, tea stands apart from coffee for a variety of reasons. One of the most interesting, perhaps, is the idea of “ritual” that seems to follow tea around like a pre-requisite. It may be an echo of rituals across the globe. It might also be the very nature of tea – the time it takes to brew and the variety of flavors that lend itself to a more sophisticated appreciation than a cup of coffee. You’d be hard pressed to find a six year old who doesn’t know what a tea party is, let alone have organized one themselves. It’s almost a phenomenon – what other social event do kids regularly orchestrate on their own? Childhood tea parties are not only incredibly adorable, they are also surprisingly well thought out. The table is set, “guests” gather around, (imaginary) tea is poured and sometimes cookies even make an appearance. Thank you Ye Olde English children’s stories for keeping tea parties alive. First things first, let’s be clear: tea in the morning requires an entirely different process than coffee. A (good) morning cup of tea requires that you heat water, steep your leaves, and wait. And wait…It’s kind of a zen experience, having to wait for your caffeine. Even if you decide to go to a cafe rather than brew at home, you never quite escape the patience that tea insists. Or, as most people call them, Arnold Palmers (we have our own spin on that from National Lemonade Day). This drink has made a name for itself over the last several years. It started with a golf hero, but it’s fair to assume that few of the 20-something’s that regularly order the well-known beverage have a clue who the man actually is. 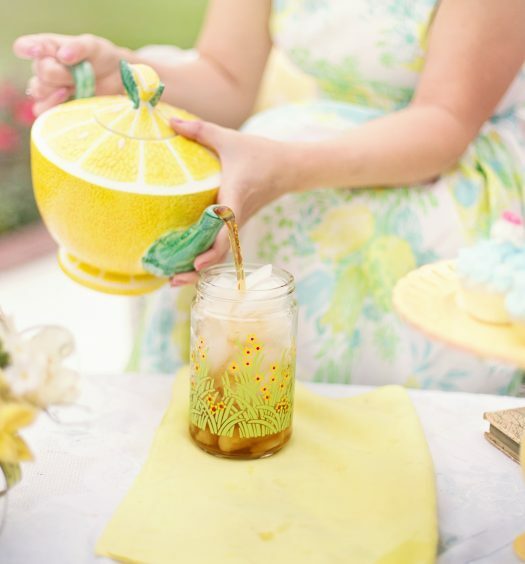 The ritual lives in routine, and it’s always refreshing to know tea can seamlessly transition into warmer months and trendier libations. “You should drink some tea.” How many times have you heard that advice when you had a runny nose or sore throat? It’s such common sense at this point, and yet you can’t get away from the suggestion. There is a conception, and a valid one, that tea has healing properties. We aren’t doctors, but the doctors we know tell us this is more or less true. Now just imagine that moment after a long day of work and a nasty head cold when you take your first sip of piping hot chamomile tea with lemon, breathing in the steam. It truly feels like you’re drinking a magical healing elixir. This always feels like a big one. A full pot of tea seems to separate the casual drinkers from the die hard. Tea, typically, is a sipping drink. A pot of tea is an hour of your life that you have dedicated to tea (and usually something else… We’re not crazy, we realize you’re probably reading a book or working on a paper too). In that moment, when you fill your pot or order a full pot at the neighborhood cafe, you’ve established yourself as a real “tea drinker.” In our books, that’s a pretty awesome commitment. We invite you to join us and share your favorite tea ritual.